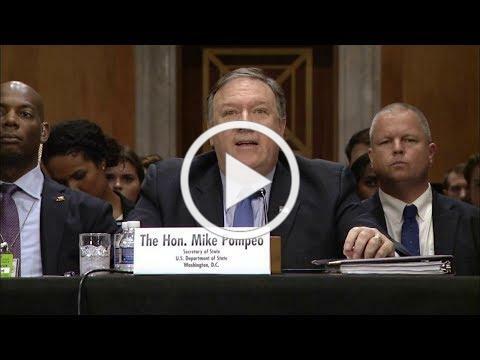 SECRETARY POMPEO: Good afternoon, Chairman Corker, Ranking Member Menendez, and distinguished members. Thank you for the opportunity to be with you today. During my confirmation hearing you asked me to work on a host of world problems, and for 12 weeks I've been doing just that. I hope we'll get a chance to talk about each of those today. For the last few weeks I've been engaged in three areas of particular interest to this committee: North Korea, NATO, and Russia. On the subject of Russia, I want to bring something to your attention right off the bat today. Today, the Trump administration is releasing what we're calling the Crimea Declaration. I won't read the whole thing. I will submit it for the record. It's been publicly released as well. But one part reads as follows: "The United States calls on Russia to respect the principles to which it has long claimed to adhere and to end its occupation of Crimea." End of quote. I want to assure this committee that the United States does not and will not recognize the Kremlin's purported annexation of Crimea. We stand together with allies, partners, and the international community in our commitment to Ukraine and its territorial integrity. There will be no relief of Crimea-related sanctions until Russia returns control of the Crimean Peninsula to Ukraine. This Crimea Declaration formalizes United States policy of nonrecognition. There's another indicator of diplomatic progress I want to mention. This morning, Pastor Andrew Brunson, who was imprisoned in Turkey for nearly two years, has been let out of jail at Buca. He's still under house arrest, so our work is not done, but it's welcome progress - one that many of you have been engaged in and something the State Department has been working on diligently as well. We will continue to work for the speedy return of all Americans unjustly held captive abroad. President Trump will never forget about our own. Our diplomacy on these issues is advancing the goals of President Trump's National Security Strategy, which laid down guiding principles for American foreign policy in December. In late April, I started executing on the strategy as Secretary of State. And today, on July 1st - excuse me, today here we are, and I want to present you some progress. THE ANNUAL CAMPAIGN FOR USUF! - Administering people-to-people exchanges for "emerging leaders" of Ukraine. Through professional and cultural programming in local communities throughout the U.S., USUF impacts the future leaders of Ukraine. To continue and grow our 2018 program support for Ukraine, we seek your generosity in making a contribution today to help the People of Ukraine. Our Annual Giving Campaign ends August 31 so you will want your gift to be credited for this fiscal year. You can also contribute by mailing your check to the U.S.-Ukraine Foundation, 1090 Vermont Avenue NW - Suite 600, Washington, DC 20005-4905. The U.S.-Ukraine Foundation is a 501(c)(3) non-profit organization. All donations are tax deductible as provided by U.S. law. Western aid programs designed to attack corruption in Ukraine are failing. Instead of acknowledging the significant degree to which Ukraine has changed for the better, Western-backed approaches misrepresent ongoing reforms as woefully inadequate. In so doing, they discredit the reforms, polarizing the country 's elites, promoting mass mobilization, encouraging left- and right-wing populism, weakening Ukraine at a time of war and Russian occupation, and contributing to the country's instability. On June 15, Ukraine's presidential race officially began when former prime minister Yulia Tymoshenko straightened her blond locks, donned hipster glasses and outlined a manifesto to revive Ukraine's economy in a 2.5-hour-long-speech in Kiev. Three days later, current President Petro Poroshenko launched his own reelection bid with an op-ed in The Post taking credit for just about every major anti-corruption reform since 2014. With Ukraine on the explosive front line of a deepening confrontation between Putin's Russia and the West, this election, slated for spring 2019, matters. Daria Kaleniuk's rejoinder to our Foreign Affairs article, "How Western Anticorruption Policy Is Failing Ukraine," misses our main point. We asserted that Western anticorruption policy was failing because it had been improperly sequenced, especially with regard to judicial reform. Kaleniuk indirectly admits this by pointing to the urgent need to create an anticorruption court three years after other anticorruption prosecutorial and investigative agencies were launched. The facts are that pressure and a focus on reforming existing courts was not a top priority for the West. Clear targets were not set nor were they met with the same alacrity as those set for investigative and procuratorial anticorruption structures. Why Is Ukraine Giving Fugitive Oligarch Dmytro Firtash a $1 Billion Windfall? Editor's note: On July 27, it was announced that implementation of the gas transportation system code has been delayed until October 1. The problems that Kharchenko outlines below with the new code still apply. Christmas comes early this year for Ukrainian oligarch Dmytro Firtash. On August 1, the tycoon may pocket about $1 billion through a new change to the gas transportation system code (GTS Code). It sounds arcane, but Ukraine's elites need to act fast to avoid awarding a giant windfall to an oligarch with ties to the Kremlin. The change in code was meant to bring the Ukrainian gas transportation system closer to European management standards ones. This month, the Ukrainian magazine Novoye Vremya interviewed fifty experts to assess President Petro Poroshenko's achievements after four years. The result was a score of just six out of twelve. Poroshenko got high scores for the approval of visa-free travel between Ukraine and the European Union; a foreign policy that provided Ukraine with allies and Western support during a difficult time; and the fact that Ukraine managed to survive despite war and economic hardship during his presidency. WASHINGTON, DC, August 2, 2018 - U.S. Senators Lindsey Graham (R-S.C.), Bob Menendez (D-N.J.), Cory Gardner (R-CO), Ben Cardin (D-MD), John McCain (R-AZ) and Jeanne Shaheen (D-N.H.) introduced the Defending American Security from Kremlin Aggression Act of 2018, comprehensive legislation that will increase economic, political, and diplomatic pressure on the Russian Federation in response to Russia's continued interference in our elections, malign influence in Syria, aggression in Crimea, and other activities. "The current sanctions regime has failed to deter Russia from meddling in the upcoming 2018 midterm elections," said Senator Graham. "Our goal is to change the status quo and impose crushing sanctions and other measures against Putin's Russia until he ceases and desists meddling in the US electoral process, halts cyber-attacks on US infrastructure, removes Russia from Ukraine, and ceases efforts to create chaos in Syria. The sanctions and other measures contained in this bill are the most hard-hitting ever imposed - and a direct result of Putin's continued desire to undermine American democracy. I strongly believe that DNI Coats' assessment - that the warning lights are blinking red when it comes to Russian meddling in the 2018 election - is accurate. These sanctions and other measures are designed to respond in the strongest possible fashion." "Vladimir Putin continues to pose a growing threat to our country and allies. While Congress overwhelmingly passed a strong set of countermeasures last year, unfortunately, the Administration has not fully complied with that legislation. This bill is the next step in tightening the screws on the Kremlin and will bring to bear the full condemnation of the United States Congress so that Putin finally understands that the U.S. will not tolerate his behavior any longer," said Senator Menendez. "The Kremlin continues to attack our democracy, support a war criminal in Syria and violate Ukraine's sovereignty. With the passage of this legislation, Congress will once again act to establish a clear U.S. policy to hold Russia accountable with one clear message: Kremlin aggression will be met with consequences that will shake Putin's regime to its foundation." "The United States must continue to take strong actions against Vladimir Putin's Russia for their global violations of international law and repeated attempts to undermine U.S. democratic institutions," said Senator Gardner. "I fully support this bipartisan measure that will impose further economic sanctions against the Kremlin and also includes my language requiring the State Department to determine whether Russia merits the designation of a State Sponsor of Terror, along with Kremlin allies Iran and Syria that are already designated. Unless Russia fundamentally changes its behavior, we must not repeat the mistakes of past Administrations of trying to normalize relations with a nation that continues to pose a serious threat to the United States and our allies." "It is once again up to Congress to strengthen America's resolve against Vladimir Putin's pattern of corroding democratic institutions and values around the world, a direct and growing threat to U.S. national security," said Senator Cardin, a senior member of the Senate Foreign Relations Committee and one of the co-authors and lead negotiators of the Countering America's Adversaries Through Sanctions Act (CAATSA). "Importantly, a number of the recommendations from the report on Russian interference I commissioned six months ago are included in this legislation. I'm pleased to partner with my bipartisan colleagues to build on CAATSA and further protect ourselves and our allies from a Kremlin that shows no sign of abiding by or respecting international norms." "For nearly two years, our nation's top intelligence officials have repeatedly warned that the Kremlin is continuing its efforts to target our elections and sow chaos among our citizens," said Senator McCain. "Until Putin pays a serious price for his actions, these attacks on our democracy will only grow. This bill would build on the strongest sanctions ever imposed on the Putin regime for its assault on democratic institutions, violation of international treaties, and siege on open societies through cyberattacks and misinformation campaigns. Moreover, this legislation would modernize our diplomatic tools and secure our critical infrastructure to better deter and defend against Putin's aggression. We must confront this challenge - not as Republicans or Democrats, but as Americans. Because ultimately, Putin's true aim is to undermine all of us - our country, our freedom, and all that America stands for." "We must stand arm-in-arm with our allies against the Kremlin's hybrid attacks on the U.S. and democracies across the world," said Senator Shaheen. "This bipartisan legislation sends a strong message of unity and deterrence against the Kremlin, while closing security gaps that leave our nation and its citizens vulnerable. I look forward to working with my colleagues in the Senate to advance this bill and harden our defenses against malign foreign influence." Provisions expediting the transfer of excess defense articles to NATO countries to reduce some NATO countries' dependence on Russian military equipment. This year marks the 85th anniversary of the Holodomor, Stalin's genocidal Famine that claimed the lives of millions of Ukrainian men, women and children. This atrocity stands out as one of the starkest examples in history of man's inhumanity to man. Participants of the Innovation Spring forum held in May at the Tech Startup School in Lviv. The creation of a Lviv Biotechnology Cluster was announced during the event. Photo Credit: Lviv City Council Press Office. The City of Lviv has begun the process of creating a Biotechnology Cluster to foster collaboration between researchers, universities, business and the local community in this dynamic and promising field. Iryna Bukhnii, coordinator of the cluster, explains that the initiative was announced during a May 2018 Innovation Spring forum at the Tech Startup School in Lviv and is seen as critical to producing economic opportunities for a new generation of Ukrainians. "The Biotechnology Cluster is a joint project which will bring together the business and university communities and the city. We want to concentrate scientific innovation in the city so that people can work here," stated Andriy Moskalenko, the deputy mayor of Lviv, as quoted by the city council press office. The city is already recognized as an important IT center and is home to the Lviv IT Cluster. Organizers of the Lviv Biotechnology Cluster believe that their initiative will continue to boost the city's image as a center of innovation and will provide new opportunities for advanced biotech research, sharing of resources and know-how, and the creation of biotechnology-related startups. Ms. Bukhnii says that the cluster is currently establishing a database of biotechnology stakeholders and assets in Lviv and will soon be launching an online platform to share information. She looks forward to cooperating with the U.S.-Ukrainian Foundation's Biotechnology Initiative, which seeks to promote the development of the biotech sector in Ukraine, particularly through engagement with research and business counterparts in the United States. Photo at top of page: Participants of the Innovation Spring forum held in May at the Tech Startup School in Lviv. The creation of a Lviv Biotechnology Cluster was announced during the event. (Photo Credit: Lviv City Council Press Office). A team of researchers from the Michigan State University is using cyanobacteria to develop bioplastics that "are derived from biological sources" and "hold the promise of being more biocompatible and potentially degrading in natural environments," said Danny Ducat, an assistant professor of biochemistry and molecular biology at the university. The researchers hope their developed bioplastics could become alternatives to single-use plastic products, disposable silverware and takeout lunch plastic clamshell containers. Environmental Protection Agency acting Administrator Andrew Wheeler plans to continue pursuing the overhaul of the Renewable Fuel Standard initiated by former Administrator Scott Pruitt. During his term, Pruitt sought to overhaul the RFS through an agreement by oil and corn groups, which did not succeed. PatentBot CEO and co-founder Nataly Vladimorova discussed the company's Facebook Messenger bot that helps you to register a trademark in 5 minutes in multiple countries. The U.S.-Ukraine Foundation Plans to Represent Ukraine, again! USUF represented Ukraine at the 2017 & 2018 New York Times Travel Shows. The 2019 New York Times Travel Show will be one of the most successful international celebration of travel, food and culture ever! Mark your calendars for the 2019 Travel Show, which will take place from January 25 - 27. Many of the past exhibitors and sponsors have already indicated they will be reserving their same space and more than 100 new organizations have expressed interest or already signed up to exhibit at the event. The 2018 Show was one of the most-highly attended Travel Show ever. The New York Times Travel Show, the largest of its kind in North America, is widely regarded as the "gateway show" for the world's travel destinations wishing to present to the U.S. market. Note: The U.S.-Ukraine Foundation welcomes inquiries from travel agencies, hotels, airlines, restaurants, conference centers, etc., for trade show representation. Tatiana "Tania" Demchuk, 77, of Cary, NC, passed away on Thursday, July 26, 2018 at her residence. A native of Lviv, Ukraine, she was born on August 29, 1940 to the late Apollinaire and Tatiana Osadca. In addition to her parents, her husband of 40 years, Wolodymyr "Walter" Demchuk and her sister Ivanna "Tina" Osadca preceded her in death. A visitation, with a parastas service (prayer service), will be held Friday, August 3, 7:00-8:30PM at Brown Wynne Funeral Home, 200 SE Maynard Rd. Cary, NC. A funeral mass will be held at 3:00 PM on Saturday, August 4, at St. Cyril and Methodius Byzantine Catholic Church at 2510 Piney Plains Rd. Cary, NC 27518. Father Mark Shuey will officiate. Burial will follow in Wake Memorial Park, Cary. Afterward the family will receive friends and loved ones at the home of Tatiana and David Guy, 203 Homestead Dr, Cary, NC 27513. For those who wish, memorial contributions may be made to Special Theatre Arts of Raleigh (S.T.A.R) , c/o Carolyn Esbenshade, 4009 Bankshire Lane, Raleigh, NC 27603. Tributes may be made to the family at www.BrownWynneCary.com. GoCamp Volunteerism ... The main goal is to educate a new young generation of active and conscious citizens of Ukraine, capable of life long learning, and prepared for the challenges of the 21st century, fluent in foreign languages and open to other cultures and experiences. GoCamp takes place all over Ukraine, including small cities and villages. Volunteers will be placed in one of the numerous GoCamps in all regions of Ukraine. Our volunteer's safety and security is our priority, so no volunteers are sent to the conflict area. The 2018 Advanced Bioeconomy Leadership Conference on the Global Bioeconomy (ABLC Global) will be held November 7-9, 2018 at the Hotel Nikko in San Francisco. ABLC Global will be home to 17 distinctive Summits, Workshops and Forums and three organizations under one big tent. Dozens of international high-level delegations and the focus and energy of ABLC and its "Networking Like Crazy" focus on cooperation, collaboration, partnership, deal-making and trend-spotting. The Speakers, the dates, the venue, and a special 2 for 1 opportunity to maximize ROI - perhaps the single broadest, most global event ever organized in the advanced bioeconomy - all ready for you at The Digest online. H1B (work visa) ready candidate from Ukraine looking for employment in U.S. I am Andriy from Kyiv. I received my H1B in January 2018 and now I'm officially authorized to work in the U.S. I possess an American MBA (UMaine Business School, year of 2004). I am looking to add to my 15+ years of global marketing and executive management experience to benefit your company. I have strong experience in IT (software developmet), digital media, e-commerce and telecommunications industries. Looking for a role of: COO, CMO, Product Marketing/Marketing Management and Business Development. Specific, detailed background information can be readily provided. Most importantly, I am a hard working professional.